Two years ago, I was in a dead-end job. I can say that now, but I didn’t get it then. You see, on paper, it didn’t look a dead-end job — it looked like success. People didn’t seem to see it as a dead-end job — they were impressed. If I wasn’t feeling happy, fulfilled, and satisfied in my career, I figured, there must just be something wrong with me. So I just did more and worked harder. I was incredibly busy, producing lots, advancing incredibly fast. Other people readily provided me with plenty of supportive feedback. ‘I don’t know how you do it!’ they’d say, amazed and admiring, and I’d bask in the glow of this positive reinforcement. ‘I’m not doing anything like that much,’ they’d say, insecure and envious. I’d rush to reassure them, and to encourage them to do more themselves. But what looked like success and productivity was driving me into the ground. I was on automatic pilot, falling asleep at the wheel of my own life. 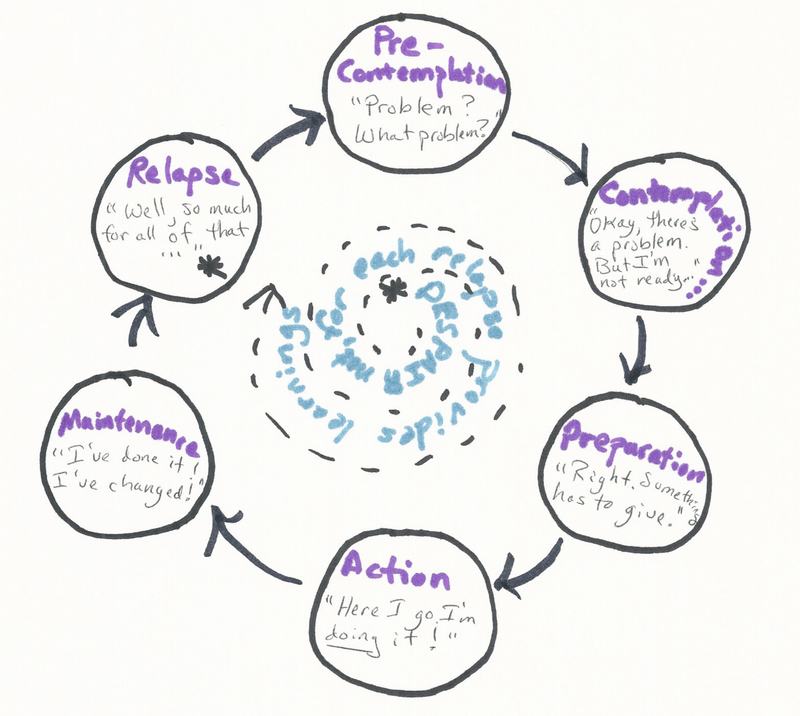 In Prochaska & DiClemente’s well-known model of behaviour change, which you can read more about here, I was firmly in the pre-contemplation stage. Problem? What problem? Stress was something that might affect other people, but I thrived on it, didn’t I? Just look at everything I was accomplishing! One day, after I’d ignored all the warning signs for months and even years, my body independently decided that it was time to move the self-destruction threat level to DEFCON 1 and to implement emergency measures. I developed something I’d read about but never seen and certainly never experienced: with absolutely no history of difficulties with verbal expression, I suddenly developed a profound psychogenic stutter. Everything I did for my work — lecturing, leading, doing psychotherapy — depended utterly upon my ability to fluently employ spoken language. And then there I was, repeating the first syllables of my intended words over and over, my throat developing a constant ache from the strain of trying to force out my sentences. I was completely professionally incapacitated. Well, you haven’t listened to any of my other signals, my body had clearly thought. Whatcha gonna do when I remove the core thing that enables you to do your job? How d’you like me now? Finally, I was forced to get the message. I was signed off work for six weeks, and started the process of transforming my life. I entered the contemplation stage of change only when I hit the wall, having spent years under tremendous strain but refusing to acknowledge it. I’d like to use my experience to help you act — far sooner than I did. 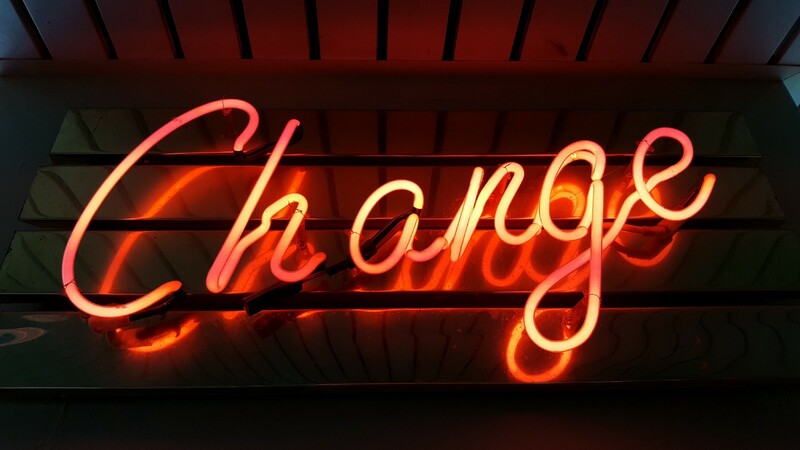 In service of that, therefore, here are four signs that you need to change your life — and some practical resources to help you contemplate, prepare for, and act towards the change you need. 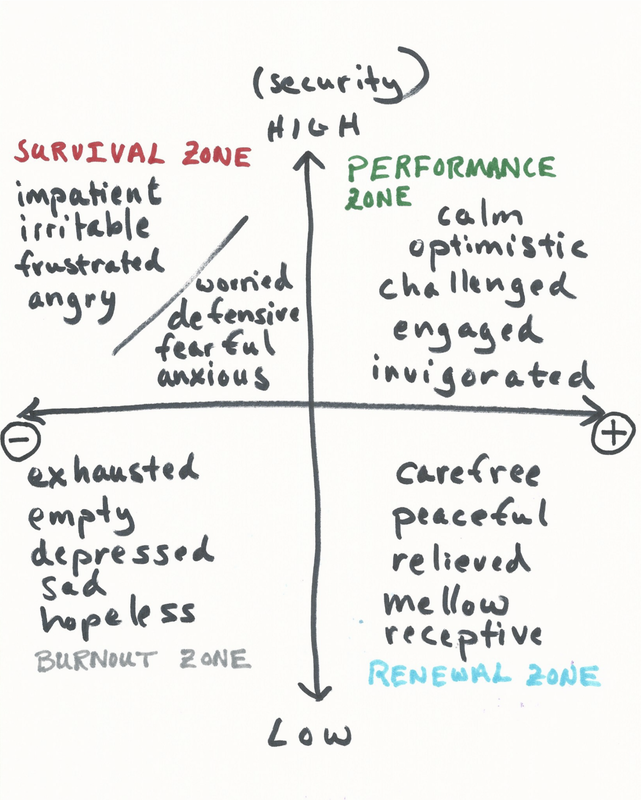 Sign one: You’re spending the majority of your time in the survival or burnout zones. Antidote: Learn to recognise the signs that you’re in these zones. Get real with yourself. How long have you been telling yourself that ‘things will get better when…’? Find your renewal zone and spend more time there. I wanted to just go to bed for the six weeks I was signed off work, but the scales had fallen from my eyes. It wouldn’t work to merely recover enough to go back into the same situation, with the same attitude. I was tired, but my recovery time had to include preparation and action towards change. So, I booked a session with a career coach. It wasn’t the smoothest of sessions because I was still struggling with my stress-induced stutter. I only had one meeting, but a particular moment has proven enduringly meaningful for me. It was when the coach took out a piece of paper and drew a simple quadrant diagram, kind of like the one below. I was utterly emotionally and physically overextended and exhausted. Students and coworkers that I’d formerly cared deeply about became depersonalised — I started to view them with anxiety and suspicion and to hold them at arm’s length. My sense of professional self-worth dropped: no matter how much evidence there was that I was competent, I thought that I was actually an unsuccessful loser who was failing and needed to up her game. I had started to hate and fear the very building in which I worked, a beautiful place surrounded by gardens that I had formerly cherished. In the model above, the idea is that continued peak performance has to be fed and nourished by spending sufficient time in the renewal zone. That looks different for different folks, but you should do whatever it takes for you to access the kinds of states described there: peace, relief, receptivity, and a sense of being carefree and relaxed. If you don’t ensure that you spend enough time in the renewal zone — and I 100% did not — you start creeping into the dreaded survival zone. For ages I juddered back and forth between survival and performance zones, failing to notice that this was not an even oscillation of a pendulum. Eventually, I spent virtually all my time surviving, before beginning my descent into the horrible, dank cellar of the burnout zone. I might have known, intellectually, that I needed some time in the renewal zone. But I didn’t act. If I had spoken to this coach earlier or taken a psychological measure like the Maslach Burnout Inventory (MBI) maybe I would have gotten real with myself. You may not be able to access the MBI, but there are other measures you can take online. Have a go. Take the results seriously. Sign two: You’re attending to what your mind is telling you and ignoring what your experience is telling you. Antidote: Have the confidence to question what your mind says, particularly when following its advice only seems to lead to more suffering. One of the foremost writers in Acceptance and Commitment Therapy, Russ Harris, talks about ‘destructive normality’. This is the idea that — far from being your friend and trusted advisor most of the time — your mind will often take you down destructive paths. And because it’s a master storyteller and skilled in the art of justification, it can easily persuade you that what you’re doing is right, or is your only choice. As we unquestioningly follow our mind’s directions, we’re often being led into greater suffering, like lambs to the slaughter. I was completely attuned to what my mind was saying, but I wasn’t paying attention to my far wiser counsel, experience. My mind told me that the path to success and happiness in life is not smooth, and that I had to endure all of this difficulty. My mind told me that what I was doing was necessary, correct, and in service of achieving all good things in life. My mind told me that stress affected other people, not me. I listened, and suffered. On the other hand, if only I’d tuned into — and been willing to believe — what my experiences were telling me, I could have turned off of that path of suffering. My experience would have told me that whatever I was doing, and however I was doing it, were NOT healthy. It would have told me that I had to stop and change something before it was too late. It would have also told me that I’d lost contact with a key compass — my values. Sign three: You’ve lost contact with your values. You can’t easily and confidently express what’s truly most important to you. Antidote: Devote time to doing a values clarification exercise. Many people orientate themselves around goals. I want to get here, I’m shooting for that job, I’m aiming for that qualification, I need that much money. While some goal-setting can be helpful, it can also backfire. A binary success/failure dynamic is created, where you either meet the goal or you don’t, which is one problem. But a more important issue is that you come to think, When I achieve that goal, I’ll have arrived. When I achieve that goal, I’ll be happy. When I achieve that goal, I won’t be dissatisfied anymore. I’ll be able to die content. Working to hit ever higher goals can be great, when they’re in line with values and in service of well being, but not if you’re setting goals blindly and assuming that everything will be fixed when you hit them. If you haven’t noticed, it never really works out that way. You achieve a goal, it doesn’t ‘work’ to do all the things you thought it would, and you set the next goal post. Living according to values is different. Values are more flexible and can be pursued in any realm of life, to small or large degrees. Values are the things we want to be, the things we want to stand for, the qualities or characteristics we want to embody or that we want our lives to have. They’re the things we’d want to honour and live even if no one were watching, judging, or expecting. When we do make goals, we should always check to see if those goals are aligned with our true values. When we’re in contact with our values and living them out, we feel more grounded, achieve states of flow, and experience life as meaningful even when it’s hard. Because living in accordance with values is connected to the performance and renewal zones in the diagram above, it should be clear that the above description is not how I was feeling in my work and life. I’d lost contact with my values. There are many values clarification exercises, but here’s one I use often. Here’s how you do it. Use the ‘Very important to me’, ‘Important to me’ and ‘Not important to me’ cards as column headers. Then, sort the values cards under each heading. After the initial sort, limit yourself to 10 cards in the ‘Very important to me’ column and attempt to rank order them from most to least important. Now, look at what’s before you, reflect, and notice where there are gaps between your values and the choices you are making in life. A few important caveats and clarifications before you do this exercise. Really have a think about these, because they’re important. First off, what’s the difference between Very Important and Important values? Well, Important values are ones that you would like to be living in accordance with as much as possible, but if there were ever a time that you weren’t living that value, it wouldn’t be the end of the world. For example, ‘growth’ or ‘change’ might be important to you, but if there are times in your life that growth or change isn’t happening and that feels okay to you, they would probably belong in the Important column. Very Important values, on the other hand, are distinguished by the fact that whenever they are not in your life, when you are not living them in some form, to some degree, in some realm, you just don’t feel right. Second, you get your values from all sorts of places. Sometimes, maybe even often, you may prioritise certain values because you feel like you should, not because this would genuinely make you feel like you are living a richer and more fulfilled life. For example, I was gunning for achievement because that had been drummed into me by my environment as an important value — but achievement in that context wasn’t actually making me feel better about life. I was pursuing achievement from a place of fear and insecurity, not value, and my efforts were leading to suffering, not vitality. ‘Achievement’, therefore, didn’t belong in my ‘Very Important’ column. In other words, try to cut out as much of the ‘should’ stuff as possible when sorting the cards. Thirdly, values that resonate the most with you should be put in the ‘Very Important’ column regardless of whether you are living according to these values at the moment. Don’t use your current behaviour/choices/situation to try to work out whether something is important to you or not. Many people are struggling precisely because the values that are important to them are not being lived. That was absolutely the case for me. Sign four: You’re ignoring the fact that your choices, strategies and behaviours are consistently taking you AWAY from your values, not towards them. Antidote: Learn to notice internal and external ‘away moves’ and to make different choices when you see this happening. Use tools to help you! Once you’ve assessed your values, you’ve got a ‘true north’, or a handful of them. Hang onto your awareness of those values, and start monitoring whether and how you’re thinking and acting in valued directions. In the course of a day, we make many decisions and engage in a lot of behaviours. Some of those behaviours are internal, inside the skin, invisible to anyone but ourselves — they’re the thoughts we think, the emotional states we experience. Some of those behaviours are external, outside the skin, ‘five senses’, observable by others in the world. Start flexing your noticing muscles. In Acceptance and Commitment Therapy (ACT) — which, again, you can read more about here — just noticing is one of the most powerful tools we have at our disposal. Just noticing — and then taking seriously what you notice — is what will bring you from a state of pre-contemplation into contemplation, then preparation, then action. Just noticing helps you maintain values-driven behaviours, and helps you get back on the horse when you lapse. Just noticing is precisely what I was not doing when I was driving myself into ill health. I suggest that you use another simple quadrant tool to help you develop your noticing skills. This is where I was, and you can see me there, in the middle — a place I wish I’d been a lot sooner — just noticing. 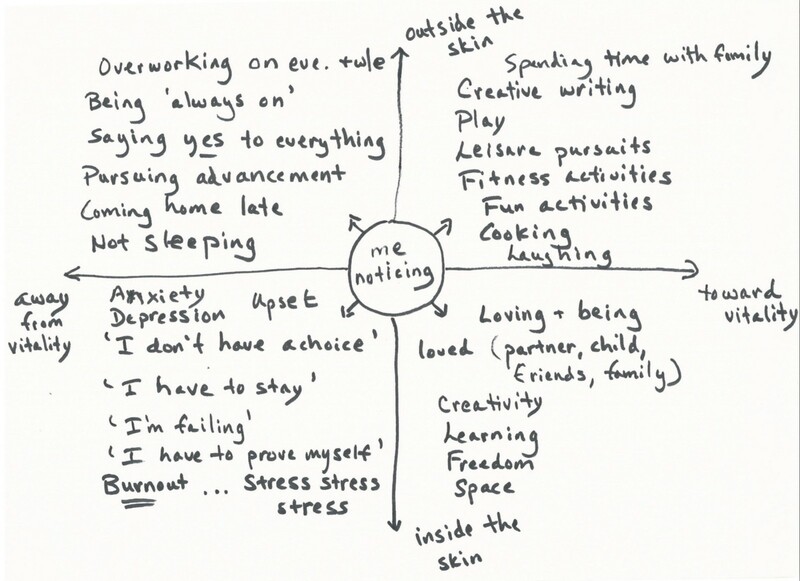 Noticing the stuff that was inside me (lower quadrants), noticing the things that I was experiencing in the world with my five senses (upper quadrants). Towards the right was vitality, passion, happiness, health. Towards the left was the burnout, despair, illness, and suffering. Time and again, because I was refusing to notice and heed, I moved left. This is a deceptively simple, incredibly effective exercise that you can do any time, anywhere. You don’t need anything more than a sheet of paper, a pen, and the willingness to climb up onto the observation platform in your mind. Slash two arrowed lines on your paper, label the axes, just notice, and write it down. This exercise is called the ACT Matrix, and you can view a video here about who originated it and how you can use it. When I crashed, it was incredibly exposing. But the experience forced me to change my ways, and alter the trajectory of my life. That’s the reason that I’m willing to expose my vulnerability and humanity again, offering you some very personal details about what I experienced when I failed to spot and heed the signs that I was heading for disaster. I do this because I want many other people to do what I did, and to do it sooner. Here, now, on the other side of all that I experienced, I am living in line with my values as fully as I can. I am moving in the direction of my values — creativity, flexibility, family and health — every day, in small ways and big. I monitor, plan and journal my values-driven actions every day in a diary specifically for that purpose, because I don’t intend to take my eye off of the ball ever again. If you’re experiencing any or all of the above four signs that you need to change your life, don’t wait. Use the four antidotes I recommended to change your course.